For the latest news, skip to Update #2. UPDATE: I’ve heard from multiple people who think that Anyvite was “hacked”. Anyvite was not hacked and no personal information was compromised or stolen. There was simply a large group of spammers who were creating events faster than we could block them, which required us to disable the free side of Anyvite. First, let me appologize for the inconvenience. As many of our regular users have seen over the last few days, the site has been slow and emails are taking a while to send. Unfortunately, this is because a group of spammers has found that they can use Anyvite to send spam emails and while we’ve tried to put some roadblocks in their way, the spammers are persistent. If anyone has received these spam emails, I greatly appologize. For now, the only option we have is to disable creating new events on the free Anyvite.com site. Premium sites are not currently affected. You should be able to continue with any existing events you already have until they’re concluded. At this time, no new events are being accepted. Anyvite hasn’t been anyone’s full time job for quite some time, but we’ve tried to keep it running because a lot of people still find it useful. Unfortunately, this means that I’m not sure if or when we’ll be able to make the necessary changes that would prevent the spammers from continuing to abuse the system. I’m sorry if this is disappointing to some of you who enjoy using Anyvite. If you’d like to try a new invitation service, you can download your Anyvite Address Book here: http://anyvite.com/address_book/export. That will include all of your contacts but doesn’t include Groups unfortunately. We’ll post any updates here if things change. We appreciate your understanding. I want to make it clear that it is not our goal to try to get people to migrate to our premium sites service. I understand that many people who use Anyvite can not afford our premium sites and don’t need the extra features that it provides. We disabled creating new events solely to deal with a spam problem that was affecting the free Anyvite service and that’s why premium sites are not currently affected. We’re looking into options to both enable the free site again and to create a lower priced premium site option, but we do not have a timeline on either option at this point. We’ve heard from a number of people who are asking for an inexpensive premium option so they can continue using Anyvite but without the higher price tag of the other premium sites. For those people, we created the Simple Plan which includes 10 simultaneous events and up to 250 guests per event for $5 per month ($60 per year, as requested in a number of the comments). If you’re interested, you can sign up here: http://anyvite.com/premium_sites/signup/choose_plan/SimplePlan. This should help people who rely on Anyvite continue to use it while we figure out where to go from here. Thanks to everyone for their feedback and support. We originally created Anyvite as a way to easily get your friends together for things like happy hours, barbeques, movies, etc. Our goal was to make it easier to stay connected with the people around you. Fast forward 5 years and connectedness has permeated almost every part of our lives. We’re just a text message, email, IM, status update, etc. from our friends and family, and all of that can be controlled by a single device in the palm of our hand. We take that connectedness for granted, until an incident like Hurricane Sandy shows us just how easy it is to go from “connected to the world” to ” isolated in your apartment”. Even when people lost power and Internet, they were still able to post to Facebook and Instagram the devestation, but when AT&T started losing towers and interrupting service, all bets were off. One of the main reasons that we became so isolated, was that over the past decade and a half, we’ve seen a mass movement away from landlines and to using our cell phone as our primary means of communication. Without a landline or a cell phone, there is no way to get in touch with a person, short of physically checking in on them, so when you lose reception, you lose your lifeline to the outside world. 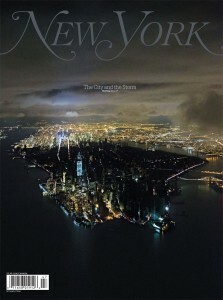 Once we had an opportunity to reflect on this, we decided that we needed to take some precautions for the next time a disaster affects New York City. The two main points of failure were losing electricity and losing reception. Electricity can be solved in a few different ways, from large battery backups, to solar powered chargers, to ingenious new devices which actually produce electricity from burning wood. Reception was a bit harder to solve, but after spending some time talking with the folks at UberSignal, we opted for a powerful cell phone repeater system, which can take a very weak signal from a tower far away, and amplify it to be usable. While this doesn’t eliminate the problem of all of the towers going out, it does mitigate it if a portion of cell towers experience problems. We’ve been so impressed with our experience, that we’ve worked with the UberSignal team to be able to offer a discount to Anyvite users who currently experience cell phone reception problems and would like to solve it once and for all. Simply use the code ANYVITE2012 when checking out at UberSignal.com and you’ll receive 10% off your order. It expires at the end of December, so be sure to use it before then. As we continue into the future, things will become even more connected and intertwined, and hopefully better safeguards will be put in place to avoid disruptions to our connected states. In the meantime though, take some time to prepare for the worst, because you never know when a freak tropical storm, earthquake, flood or forest fire will rear its ugly head. Since we launched Anyvite back in July of 2008, we’ve consistently received requests to incorporate some sort of ticketing or money collection functionality into Anyvite. These suggestions made obvious sense to us, since events and ticketing go hand in hand, but for one reason or another, we were never able to offer an integrated ticketing service. With the new year, we resolved to change all of that. Over the past month, we’ve been working to implement the ability to receive money from your guests and issue tickets to events that you’re hosting. As with all things Anyvite, our goal was to make this process as simple and straightforward as possible, so we’re happy to announce the release of “Anyvite Simple Ticketing”, the easiest way to create and sell tickets to your events. It’s incredibly easy to get started. 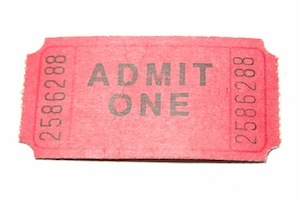 Simply begin by creating an invitation as always, and once you reach the step where you’re entering your event details, you’ll notice a new box which says “Sell Tickets and Collect Money from Your Guests”. Click the checkbox there to enable ticketing, fill out the ticket information and add in your PayPal account. That’s all there is to it! You can then send the invitation to guests or mark it as public and share the URL via social media, and guests will be able to purchase tickets right from the invitation page. PDF tickets are automatically generated for each order and sent via email. 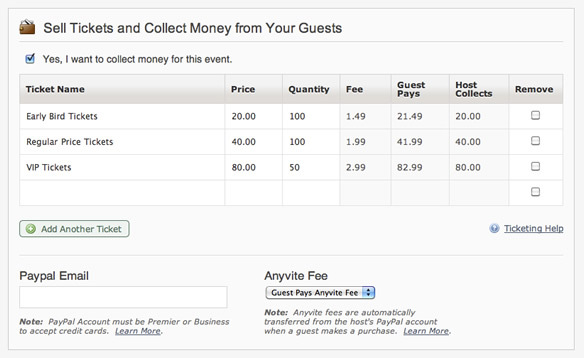 Anyvite collects a fee per ticket at a rate of $0.99 + 2.5% of the ticket price, with a maximum fee per ticket of $9.99. There is no initial fee to get started, and the Anyvite service fee is automatically deducted when an order is placed, so there is no additional work for the host or billing after the fact. We’re really excited about this new offering and the potential it offers to event hosts using Anyvite for their invitations. You can find out more by reading the Anyvite Ticketing Guide, and as always, we’d love to hear your thoughts on “Anyvite Simple Ticketing”. It has now been 32 hours since we rolled out Anyvite Plus and a single banner ad for free invitations. Overall the response that we’ve received has been a positive one, but there have been some edge cases which the new pricing structure caused problems for. Specifically event organizers who create a lot of small events and would prefer not to have advertising shown on their invitations, but don’t require the increased guest list size or additional customization features. The volume of invitations that they create would result in a significant expenditure over the course of a year, so in order to make that a bit more palpable, we’ve just rolled out an additional pricing option that only removes the advertising from your invitation for the significantly reduced price of $3. As always, we’d love to hear your thoughts and concerns with this new pricing option, as well as all of the other changes we’ve made in the past few days. 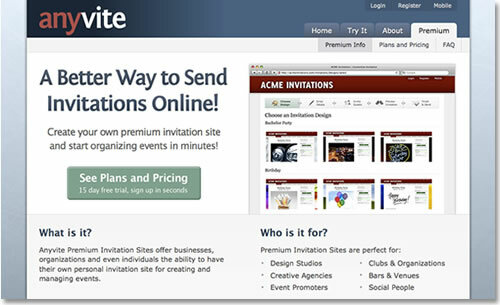 For the past two years, Anyvite has been the easiest way to create and send invitations online for thousands of people. Over the past few months, we’ve seen a steady increase in new people discovering just how easy it is to send invitations with Anyvite, which has introduced its share of new challenges for the service. In order to continue offering the same level of functionality and reliability that Anyvite has become known for, we’re going to be making a few improvements in the coming days, which we’d like to share with you. We’ve noticed two main problems that we feel need to be addressed in order to continue providing a great service. As with any increase in visitors to a website, the servers which power the service take a beating, which we’ve seen evidence of in recent months with slower page loads and sporadic periods of downtime. Some individuals have started taking advantage of the 1,000 guest list limit to mass email large groups of people for their own personal gain, resulting in email delivery problems for all users across the board. While we understand that occasionally some events are misinterpreted by end users as spam, steps must still be taken to limit these types of events in the future. To deal with these issues, we’ve decided to take the current free service and break it into two tiers, Anyvite Basic and Anyvite Plus. While Anyvite Basic is suited for most events, we realize that there are some event organizers who routinely invite more than 250 guests and prefer invitations without advertising. For them, we’ve created Anyvite Plus, which features advertising free invitations and an increased guest list cap of 1500 people (which is 50% larger than the current Anyvite offering). In addition, we’re also introducing significantly enhanced capabilities for customizing the look and feel of your invitations, including changing fonts, colors, styles, and even allowing the use of custom CSS. You can get all of these new features and functionality for the low price of $10 per event. We’re really excited about Anyvite Plus because it gives us the opportunity to release great features, like enhanced customization options, to users who can really take advantage of them. It also gives power users a way to contribute to Anyvite, so we can continue to provide and improve upon the service you know and love! These changes will be going into effect for all newly created events starting on November 1st, 2010. Everyone should start seeing improvements in page load speed and less downtime almost immediately, and a higher percentage of emails being delivered directly to recipients inboxes as time goes on. We’d love to hear your feedback on these changes, so please contact us at any point with your thoughts. Thanks and happy holidays! So Long ShareSpace, and thanks for all the fish! Today we said goodbye to a feature that has been with us since the beginning. When Jeff and I were first creating Anyvite (it was called Coordinatr then!) I snuck in a feature I called the ShareSpace. The idea was you would upload pictures and video to Flickr and YouTube, tag it with some text we gave you and it would then show up on the ShareSpace page of your invitation. It was a good idea but wasn’t executed to its full potential. That combined with constant problems with Flickr images not showing up in their public search ment lots of problems. And since it was one of our least used features, we decided to choose the easy path and remove it entirely. It may seem strange to some, but I celebrate the removal of a feature just as much as adding a new one. Most people who haven’t created web or other applications don’t realize that each additional feature compounds the overall complexity of a system. So the more features you have, the harder it is to make the entire system run well. But it’s not all bad news! We also recently added support for Gravatars which means some of your guests will have profile pictures now without ever having to upload their own to Anyvite. This is especially helpful for technical events since people who comment on blogs are the most likely to have Gravatars setup. We also simplified the navigation to the Manage Guests page from the invitation. Since we removed the ShareSpace link, we were able to breakout the “Invite Guests” and “Manage Guest List” pages into two separate links which should make it easier to navigate around the invitation. Sorry it’s been a while since we’ve written. Jeff and I have been incredibly busy with lots of different projects but that doesn’t mean we’re neglecting Anyvite. We’ve been constantly making improvements to the parts of Anyvite that you can’t see. For example, just this morning we pushed out a few fixes for some Address Book issues that have be affecting some people and making it impossible for them to edit the names of their contacts. This is a great example of the things we’ve been working on that you would never notice if we didn’t mention it here! So that’s the current status of things. If you have questions, leave a comment below! New Anyvite Potluck Feature for the Holidays! With the holidays rapidly approaching, the number of potluck type of events organized with Anyvite will increase dramatically. While it is possible to manage these type of events using the description field and comment board, it’s much much easier to have built in functionality to handle the “who’s bringing what” question. In response to this, we’ve developed a “Potluck” feature on Anyvite for hosts to specify and manage the items which they would like guests to bring to an event. Next time you’re creating an invitation where you need guests to bring different items, simply enable the Potluck feature on the “Edit Details Page” by clicking the checkbox next to “Have Guests Bring Items to your Event (Potluck)”. 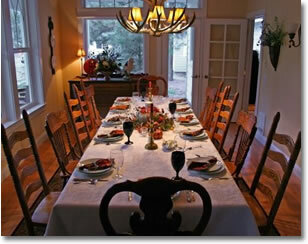 Then, fill in the items that you would like guests to bring and how many of each you need. Finally, decide if you’d like your guests to be able to see who is bringing each item, or if you’d just like to restrict that view only to the host of the event. Once you save and send that invitation, anyone who RSVPs will have the option to select an item to bring to the event. The summary table will display all of the items available to bring, how many are needed, how many are still remaining, and who is bringing each item. If you would like to print this information out, simply export the guest list and the potluck information will be included with the guest’s name and RSVP type. Hosts are able to change or remove the item that guests are bringing by using the “Change RSVP” link under the name of the guest (or if profile pictures are disabled, clicking the guest’s name). For now, we’re restricting who can select an item to only guests who RSVP “Yes” to an event, for the obvious reason that you don’t want a guest who RSVPs “Maybe” to be responsible for a crucial item and then not show up. If you feel differently about this, please contact us and let us know what your ideal solution would be. Keep an eye out for many more exciting additions and updates to Anyvite! Also, please remember to switch over your Groups to Contact Lists before the end of the month! Over the past few months, we’ve been working on some exciting new projects, one of which we launched last month. Today, we’re happy to announce the release of another of those projects: Anyvite Premium Invitation Sites. Anyvite Premium Invitation Sites allow businesses, organizations, clubs and even individuals to have their own fully customized site dedicated to organizing events under their own brand. 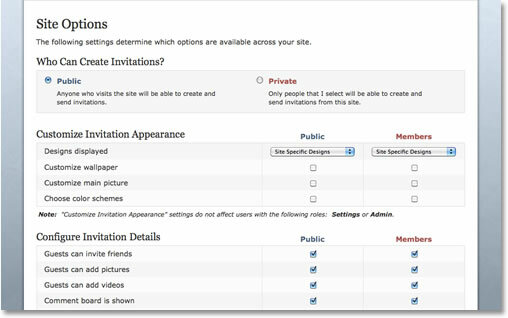 Sites are able to be configured as either public (anyone can create a branded invitation) or private (you designate who can organize events), and consist of a whole array of options which can be toggled or disabled at will. Getting started is as easy as selecting a plan, choosing a site name, and adding in your billing info. Every plan comes with a 15 day free trial, so if you’re not satisfied with the experience, simply cancel your plan before the 15 days are up and you won’t be charged a thing. As an added incentive, we’re providing our basic site design customization service for free to any new customers. Simply sign up for a site, and then send us an email with your new site’s URL, as well as information about how you would like to customize your site. 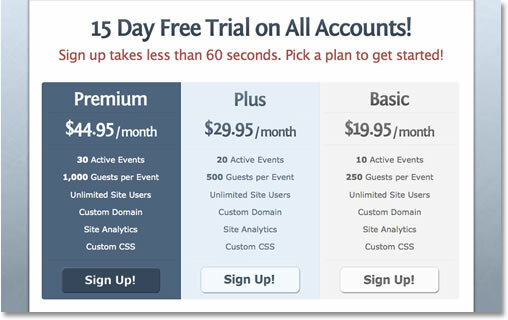 Premium Sites are perfectly suited for existing businesses which conduct a large number of events on a regular basis and are looking to add another offering to their existing services, or for groups and organizations looking to further their brand by utilizing events as means to connect with existing or future customers. If you have any questions about Anyvite Premium Invitation Sites or if our current packages don’t fit your needs, please contact us and we’ll get things sorted out for you.